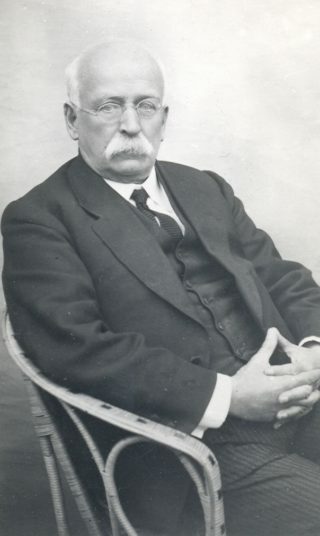 I’d like to think that every Garden Citizen in Welwyn and Letchworth knows who Ebenezer Howard was: namely the founding father of both towns. Reams have been written about him and I, certainly, have been guilty of that in my history of WGC. From humble beginnings he worked for many years as a Parliamentary shorthand writer, but his chief skill, it appears, was to enthuse and attract talented people and convince them of the merits of the Garden City principle. He is commemorated with the Ebenezer Howard memorial at the top of Howardsgate, the pivotal road that honours his name, and the Howard Centre, that opened in the early 1990’s which has a very attractive bronze relief of Howard on the wall, beside the newsagents on the first floor. This was unveiled by his grandson, Tony Rawlinson, who only died recently (Spring 2009). Despite what a lot of people think, Ebenezer Howard’s role in the founding of WGC was quite low key. He took an active interest in all the town’s many affairs and sat on the first Parish Council, but he had no real influence in the town’s development, and his contemporaries note that he didn’t really want any, but the directors felt obliged to inform him of any changes in policy. Recognition of his services to the New Town movement came almost too late. An OBE in 1924 was followed by a knighthood in 1927. From his home at 5 Guessens Road, he regularly pottered around the town, always deep in thought. This page was added on 19/06/2009.